Government has ratified the decision of Central Board of Trustees (CBT) to retain the Interest Rate of Provident Fund to 8.75% for the current fiscal year i.e. for 2014-15. The CBT had decided the interest rate in the meeting held on 26th August but the?procedure of the implementation of the interest rate of provident fund requires?approval for the same by the Finance Ministry. The decision would now be notified by the Labour Ministry and Income Tax Department. The interest rate was increased by .25% in 2013-14 (8.75%) from the year 2012-13 (8.50%). But this year the interest rate remains same as previous year. For Fiscal Year 1978-79 bonus of 0.5% was applicable to the members who did not withdraw any amount from their Provident Fund account during 1976-77 and 1977-78. For Fiscal Year 2000-01, interest rate was 12% for the quarter starting from April to June, thereafter 11% from July onward on monthly running balance. 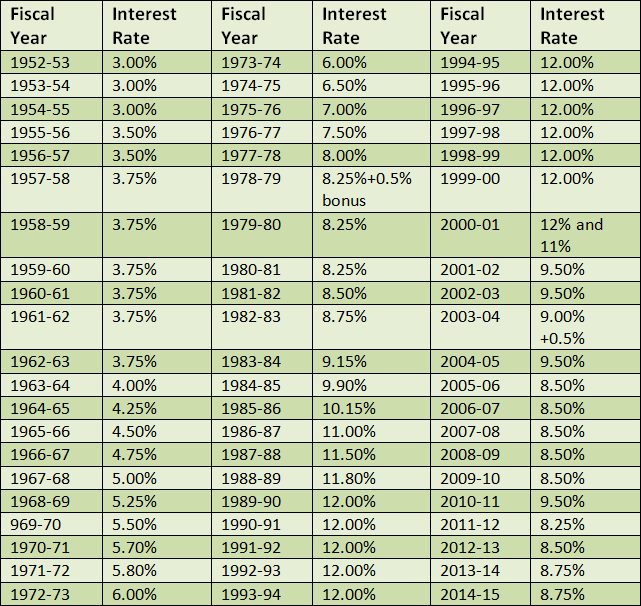 For Fiscal Year 2004-05, bonus of 0.50% was Golden Jubilee Interest Rate bonus.